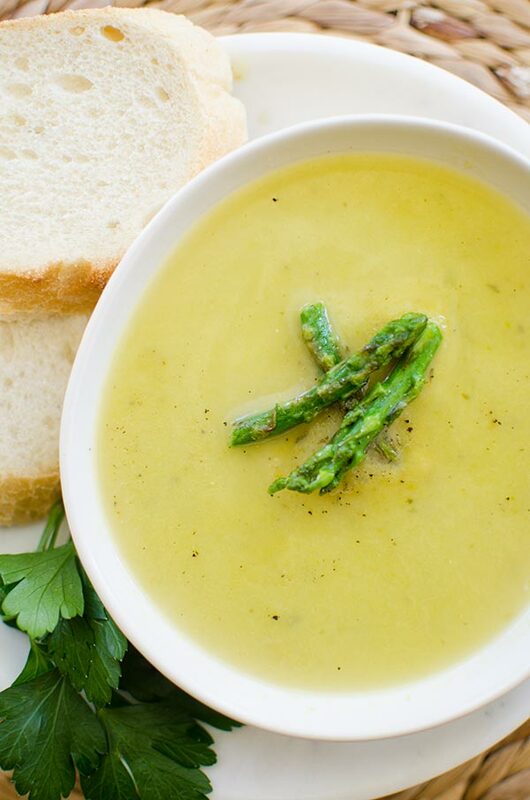 Light asparagus soup recipe with leeks, parsley and garlic without the addition of cream. Asparagus is a delicate flavour; it’s not bold, it’s more of a subtle undertone. A sweet, grassy flavour that instantly reminds me of the spring. I usually roast asparagus as a side, but I wanted to try my hand at building layers of flavour in a light asparagus soup recipe. 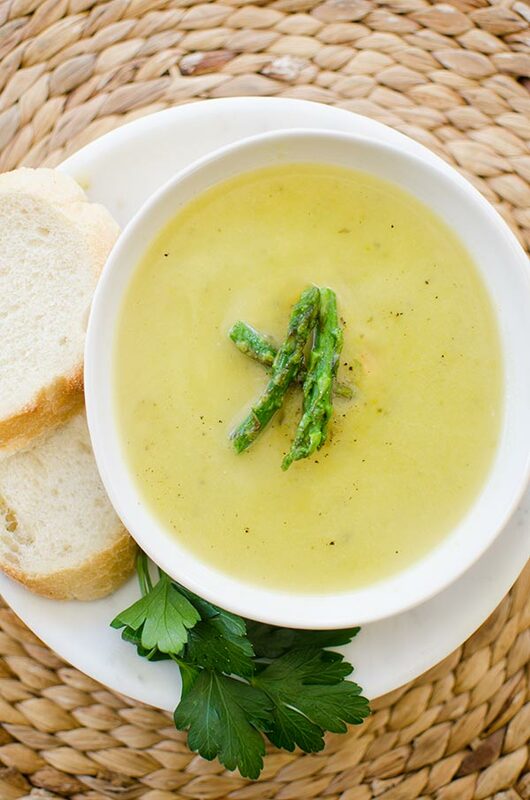 The base of this soup are leeks and asparagus which are sauteed in butter with some garlic. The simplicity of this recipe reminds me of a simple new intentional mindset I’m working on. My pursuit of positive thinking has brought me back to my favourite author, Brene Brown. After revisiting her latest Rising Strong, I’ve begun to ask myself the question; Do you believe that people are doing the best they can? I have definitely been there, where my best just isn’t quite enough. I’ve also been in situations where I’ve felt let down/annoyed/frustrated by someone else, but I think having this ‘doing their best’ in the back of my mind is going to be such a good way to help feel compassion towards others! Especially when, as creatures with feelings and emotions, it can be so easy to focus on ourselves. It doesn’t mean that it’s ok, we still need to have boundaries to protect ourselves and stick to those, but I think that knowing that everyone is trying their best is an important part of being understanding/compassionate. What do you think? I also realize that 99% of you are here for the food, but I kind of like the idea that if you happen to read and scroll, maybe you’ll take something away from this post, in addition to the delicious asparagus soup, obviously. The trick to making this soup is to build flavour throughout (AKA season as you go!). Adding cayenne pepper and lime juice help to intensify the asparagus taste, without overpowering it with additional flavours. I have chosen not to use any broth or cream in this recipe because I wanted the soup to have a clean and bright flavour. Plus, the less ingredients, the better, right? In a medium pot, melt 1 tbsp butter over medium heat. Add asparagus tips, saute for 2-3 minutes or until beginning to brown. Sprinkle with a touch of salt, remove from pot and set aside. Add remaining 2 tbsp of butter, leek and 1/4 tsp salt. Cook until softened about 4 minutes, add garlic and asparagus. Cook another 4-6 minutes. Season with another 1/4 tsp of salt. Add water and bring to a boil. Reduce heat to a simmer, and cook, partially covered for 10 minutes. Add parsley and puree with an immersion blender or in a regular blender. Return to pot, add in reserved asparagus tips and season with remaining 1/4 tsp of salt, pepper and lime juice. 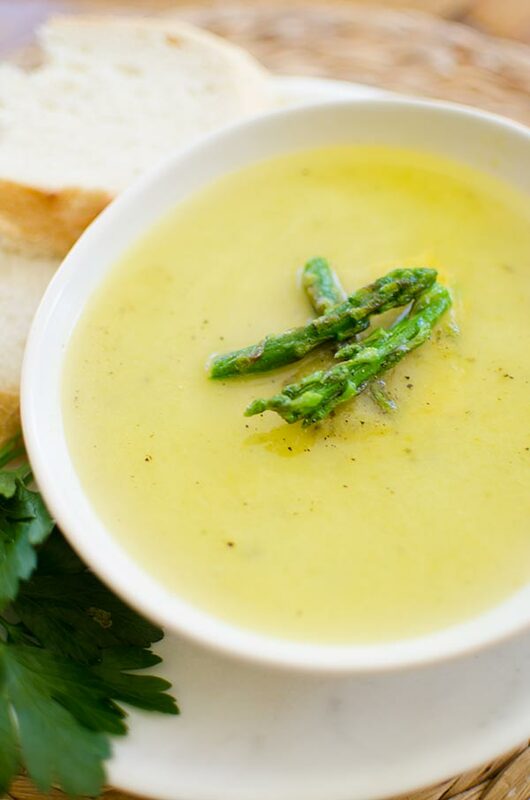 Let me know if you give this lightened up asparagus soup a try! It is a cold and rainy May day here in Boston, so this soup was perfect! There's not too much at the farmers markets yet, but I did find some gorgeous asparagus yesterday. I loved this way of preparing it!Also, LOVE Brene Brown! She is my idol. I'm so glad that you loved the soup, Emma! Thank you for sharing, Brene Brown is 100% my idol as well. :) Happy cooking!